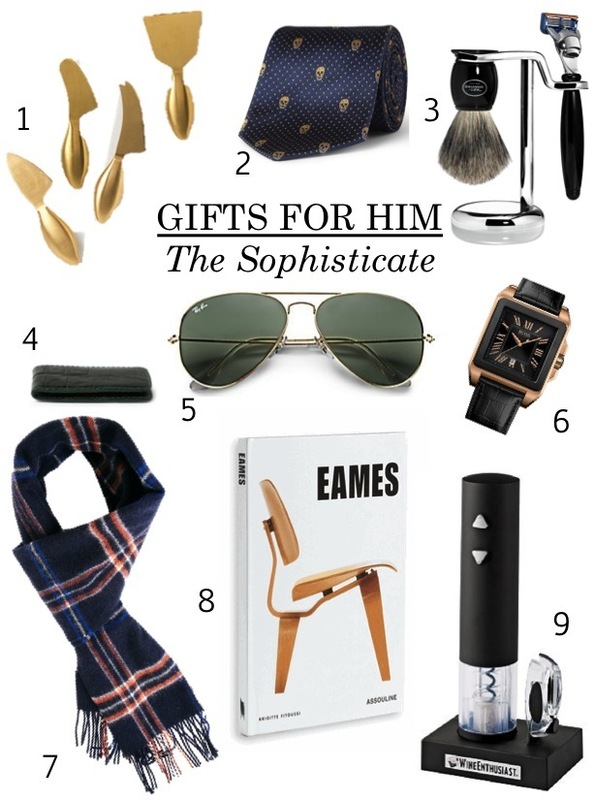 For the sophisticated man in your life, go for the classics - a universally flattering pair of Ray-Ban aviators, a plaid scarf, a luxe money clip - things they may not buy for themselves but that they will use all the time. On that note, every guy loves a new gadget. Throw some wine into the mix and you have a sure fire winner of a gift with an electric corkscrew. I gave one to my boyfriend last year and he still loves to show it off whenever we have friends over for dinner. Have no fear, you don't have to spend a fortune just because he likes the good life. I recommend a design related coffee table book for a budget friendly buy. Consider this one on Eames, it makes an impact in style but doesn't leave a long lasting impression on your wallet. For more great gift ideas, view all of my holiday gift guides here. Those cheese knives are stunning- I want them! And those Ray-Bans would be awesome for my guy- he keeps borrowing mine. Ha! I really like that scarf, it's masculine but not ugly! So I can testify to the wonders of an electric corkscrew! No more bits of cork in that wine bottle... totally worth it. Great little round up here! I totally want to buy that tie for every guy I know! my boyfriend totally falls under this category and i can see him loving any one of these items! Great list and those cheese knives are so cute! Definitely appreciate your guide. I like the tie. It's different. These are such great gift ideas! I definitely know a boy who would love almost all of these :) Thanks for the awesome post!